Austria Pop-Up Store New York! For two weeks this October, you won't have to travel far to experience Austrian culture first-hand. Visit the first ever Austria Pop-Up Store at Openhouse Gallery in Nolita for a unique combination of Austrian culinary highlights, imperial history, stunning art and architecture and music. Come and linger over a cup of authentic Viennese coffee and a slice of sumptuous chocolate cake at the temporary Sacher Café or sample Austrian specialties like pumpkinseed oil and artisanal chocolates at the Austria Deli. Art aficionados will enjoy displays by Vienna's Kunsthistorisches Museum (Museum of Fine Arts), and WIEN PRODUCTS which features typically Austrian design objects. If it is travel advice you need, our experts at the Austrian Airlines Travel lounge will help you put together a personalized itinerary. Don't forget to stage your own "perfect kiss" in front of Klimt's famous painting "The Kiss" and have a foto of it sent to you. 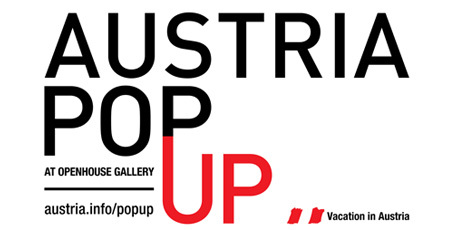 More detailed information and a complete schedule of events is available at www.austria.info/popup.